Photos from Uptown Swing Dance on Saturday, November 25, 2017 with the Gordon Webster Band during the Skye Humphries and Naomi Uyama workshop weekend. Photos from Skye Humphries and Naomi Uyama’s workshops held on Friday, November 24 to Sunday, November 26, 2017. Photos from Uptown Swing Dance on Saturday, November 26, 2016 with the Gordon Webster Band during the Skye Humphries and Sylvia Sykes workshop weekend. Photos from Skye Humphries and Sylvia Sykes’ workshops held on Friday, November 25 to Sunday, November 27, 2016. Photos from Uptown Swing Dance on Saturday, November 28, 2015 with the Gordon Webster Band during the Skye Humphries and Naomi Uyama workshop weekend. Photos by Tom Hagar & Tony Tye. Photos from Skye Humphries and Naomi Uyama’s workshops held on Friday, November 27 to Sunday, November 29, 2015. 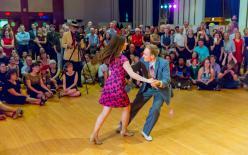 Photos from Uptown Swing Dance on Saturday, November 29, 2014 with the Gordon Webster Band featuring Naomi Uyama during the Skye Humphries and Naomi Uyama workshop weekend. Photos by Tom Hagar. Photos from Skye Humphries and Naomi Uyama’s workshops held on Friday, November 28 to Sunday, November 30, 2014. 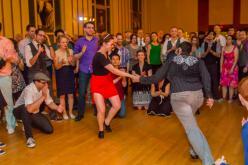 Hop to the Beat Black Bottom Routine Class performance on Friday, March 29 at Boston Swing Central. Beantown Camp performance on Saturday, June 24, 2017 with the Hop to the Beat Routine Class. 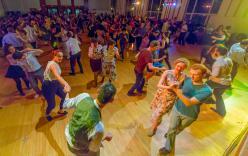 Uptown Swing Dance performance on Saturday, May 12, 2018 with the Hop to the Beat Collegiate Shag Routine Class. Lil’ Rhody Big Swing Out performance on Saturday, April 28, 2018 by the Hop to the Beat Routine Class. The Sit-Down Strike number from Beantown Bounce , performed by The Frankie Foundation Ambassadors at Beantown Camp 2017. Choreography for Sit Down Strike by Joshua McLean. Choreography for Suit and Tie by Shana Maria Weaver and Brandon Barker.﻿ Performed by (from left to right of opening scene) Steven Plummer, Joshua Chidebelu-Eze, Alexis Davila, Cyle Dixon Jr., Jonas Chidebelu-Eze, Shana Maria Weaver, Brandon Barker, Joshua Mclean and Samuel Coleman. Uptown Swing Dance performance on Saturday, May 20, 2017 by the Hop to the Beat Routine Class. Dirty Dozen Weekend performance on Saturday, April 29, 2017 by the Hop to the Beat Routine Class. Skye Humphries and Sylvia Sykes performing at Uptown Swing Dance on Saturday, November 26, 2016.